Nami, a talk show hostess, tells her audience to send in home videos to profile on her late night program. Soon, she receives an anonymous videotape in the mail – a tape containing terrifying imagery. She watches in horror as an unseen filmmaker follows a route to an abandoned factory – and brutally tortures and kills a woman on camera! A crew is assembled and they set off to follow the videotape’s trail to the foreboding location. What they find there is a horror beyond imagination! There is someone… or something… in the mysterious building. Something waiting in the shadows to torture and murder them one by one. With EVIL DEAD TRAP, director Toshiharu Ikeda has created a nightmarish experience. The kinetic visual style is reminiscent of Dario Argento (SUSPIRIA), David Cronenberg (SPIDER) and Sam Raimi (THE EVIL DEAD) and it builds with genuine suspense and terror. 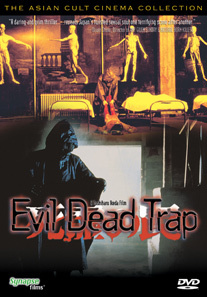 Written by Takashi Ishii (GONIN 1 & 2), EVIL DEAD TRAP is a masterpiece of Japanese horror cinema that will leave you breathless!